The tale of the sharp shooting Swiss archer gets a re-telling in Wilhelm Tell, a superbly designed 5 reel, 20 payline video slot from Yggdrasil Gaming. 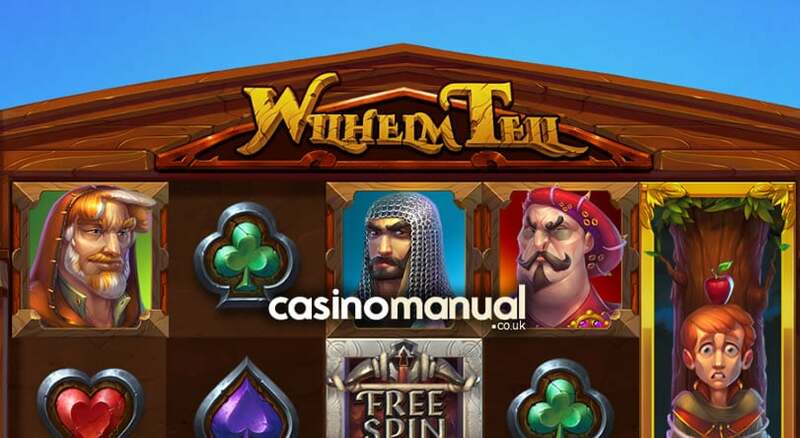 Look out here for wilds that can nudge to fill whole reels as well as a feature round where you’ll be offered 1, 5 or 10 free spins with multipliers of 50x, 10x or 5x. Play on your computer, tablet or mobile device from between 20p and £50 per spin. As usual for an Yggdrasil Gaming powered title, Wilhelm Tell is very easy on the senses. Backed by a classical Rossini score (The Thieving Magpie will get you tapping your toes in the base game, the William Tell Overture in the feature), the setting is a tranquil Alpine vista. The reels are set within a wooden hut and include heart, diamond, club and spade symbols alongside a trio of characters from the famous folk story. The best of them is Hermann the baddie. Land 5 of him and you’ll pocket an award of 7.5 times your bet. Wilhelm Tell’s son Walter, tied to a tree with an apple on his head, is the wild. This wild spins in 3 high stacks. If a wild lands and an expansion would result in a winning combination, then it nudges up or down to create that new winner. This is called the Wild Nudge feature. Feeling lucky? Have a crack at the high risk 50x boost. Play it safe with the 5x multiplier. If you go with the 50x multiplier, you could win 7,500 times your total bet! If you opt for the 5x or 10x multiplier options, you can win a maximum of 750 or 1,500 times your bet (on each free spin). Wilhelm Tell is a simple game, albeit a very good looking and sounding one. You can expect to land the nudging wilds regularly. We found the Free Spins feature quite tricky to hit but the multipliers can make it a tempting proposition. The volatility is on the low side. It’s not the most feature packed video slot you’ll see but for classy design and simple gameplay, then Wilhelm Tell hits the target. The appeal of the 50x multiplier is also very tempting. If you like big multipliers, NextGen Gaming’s 300 Shields can give you a 300x multiplier in the feature!